This week's story about a Cook County judge getting suspended after allegedly allowing a law clerk/ staff attorney (and judicial candidate) to wear a robe and decide cases on the judge's call has grown national legs. the New York Daily News. If a Google search this morning can be believed, a couple of Chinese-language sites have picked up the story as well. Sheriff's office attempted to cover-up Judge scandal at the Markham Courthouse. Numerous sources saying a Deputy wrote a memo stating Judge was allowing her friend to wear a robe and play Judge on the bench. The Deputy's memo was never reported by the Sheriff's office. The Sheriff's office is now claiming they did not know if Judge was running a "training" exercise. Numerous sources say this is a lie cause Sheriff Dart blew a gasket today in his office as he just learned the Deputy documented the incident. I'm not accepting SCC's reported rumor as fact. But, whether it's true or not, it reminds us, or it should, that this Turner-Crawford business is more that what-were-they-thinking story. There's another story here, too, namely, whether anybody could have, or should have, seen this coming -- and maybe even headed this off. Because this is not a 'funny story' for the people involved. It's at least career-threatening, maybe even career-ending. And, on paper at least, nothing in Judge Turner's background, at least, suggested that she would ever have thought this unauthorized job-sharing to be a good idea. As Mark Brown's August 17 Sun-Times article pointed out, Judge Turner came to the bench after "two years as an assistant U.S. attorney and six years at Kirkland & Ellis. She received her law degree from the University of Chicago." 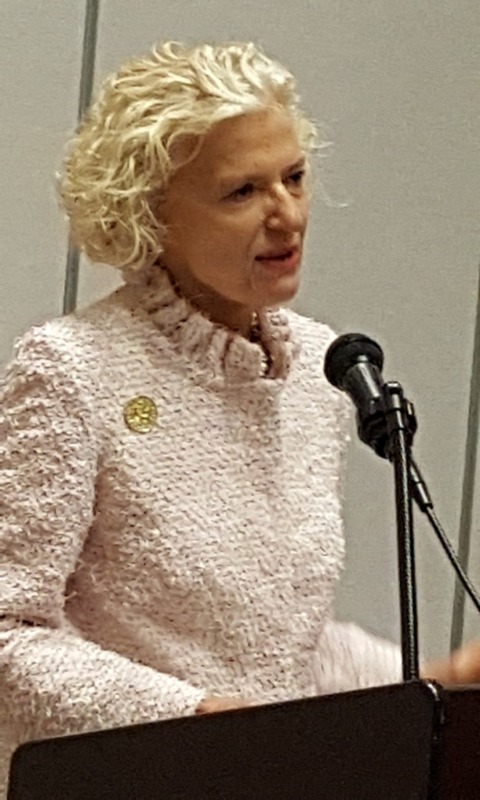 Since her election to the bench in 2002, Judge Turner was found recommended or qualified for retention by every bar group, both the CBA and every Alliance member, in both 2008 and 2014 (the sole exception being a negative review from the Chicago Council of Lawyers for the 2008 retention election -- and, as noted, the CCL urged a yes vote for Judge Turner in 2014). So I have to think that maybe something changed for Judge Turner between 2014 and whenever she first let Ms. Crawford don her robe. But maybe not -- that's what investigations are for. But take that step back with me now. Let's just talk about judges generally, not about Judge Turner or Ms. Crawford. I realize that judges have pretty autonomous working conditions. But judges typically have support staff, at least a courtroom clerk and (as SCC notes this morning) a courtroom deputy. Every judge has at least a supervising or presiding judge to whom he or she reports. No, there's no clock-punching---quite the opposite---and there are no ra-ra meetings in the breakroom (although wouldn't that be pretty cool? OK, team, we're having a special on 2-615 motions this week...). But, still, there are people who interact with any judge often enough that a marked change in behavior, in demeanor, in appearance... for whatever reason... illness, substance issues, depression... you'd think something might have been seen. By someone. Wouldn't you hope something might also be said? Now, maybe, that judge---that hypothetical judge we're now talking about, not anyone in particular---might respond to a friendly offer of help or concern by biting the head off of the person having the temerity to ask. Or maybe he or she might burden the person asking with more than he or she can handle alone. There's a range of possible responses. But if your helping hand is slapped away, mightn't you then take your concern to the judge's supervisor maybe even the Chief Judge? I just don't see why a situation has to get so far out of hand, to the point where someone jeopardizes their career, or worse. If it was you who'd wound up, for whatever reason, in a bad place, wouldn't you want someone to offer help? Wouldn't you want someone to warn your supervisors before you harmed yourself or your livelihood? So wouldn't you, shouldn't you, want to offer help if you see a judge---or any colleague---drifting into peril? When the snickering stops over the Turner-Crawford business, I hope that this thought remains. 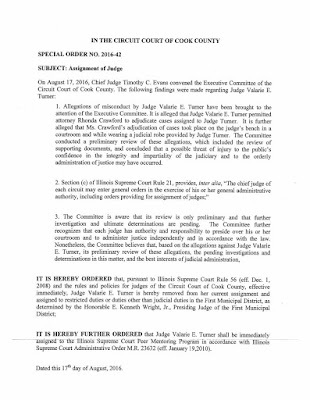 In an order released Thursday (click here to access), the Illinois Courts Commission censured Judge Beatriz Santiago for violations of Canons 1 and 2 of the Code of Judicial Conduct, Supreme Court Rules 61 and 62. For the non-lawyers who follow along here, the censure order means that the Courts Commission agreed that Judge Santiago was guilty of misconduct, but did not deem that misconduct sufficient to remove her from office. Questions of residency had dogged Santiago since she announced her 6th Subcircuit judicial campaign in the Fall of 2011. The timeline provided by the Courts Commission Order serves as the basis for the summary that follows. Santiago, a career Assistant Public Defender before being slated for the bench, bought a house in 2005 on Spaulding Avenue. The house was in walking distance of the home where she grew up, on Potomac Avenue, but it was just a couple of blocks outside the 6th Subcircuit (it was just inside the 7th Subcircuit, if that's of vital import for you). She fixed up the house and moved in and lived there just like anyone else would live in their own house for a number of years. But then Santiago was slated to run in the 6th Subcircuit. She could not continue to live in her own home and run for judge in the 6th Subcircuit. Goodman v. Ward, 241 Ill.2d 398, 412, 948 N.E.2d 580 (2011). So, she said, sometime in August or September 2011, she moved back to her parents' home. Several other candidates coveted the vacancy for which Santiago was slated. Two challenges were filed to her candidacy, at least one of these asserting that Santiago lived in the house that she owned and not, as she claimed, back with the folks. The Courts Commission quotes from the hearing officer's opinion in one of those challenges in its August 18 Order, at p. 2: "The hearing officer found that despite 'a number of facts regarding [respondent's] residency that are not entirely plausible,' there was not sufficient evidence to 'conclusively establish' that respondent did not reside at the Potomac property." The Cook County Electoral Board adopted the hearing officer's findings and recommendation and Santiago was permitted to remain on the ballot. But she still had the house on Spaulding. in Section II, that the Spaulding property would be her "Primary Residence,"
in Section IV, that she owned the Spaulding property as her primary residence. The lender did a background and credit check and (p. 3) "discovered that most of the documents accompanying respondent's application, including pay stubs and proof of employment, showed respondent lived at the Potomac property rather than the Spaulding property." It asked for an explanation. In two letters requested by the lender, Santiago said she just used her mother's Potomac address for work-related issues, and that it was a former address. On August 9, 2013, Santiago completed and signed an occupancy certification that the lender provided. On that same day she signed a "mortgagor's affidavit" in which she certified, "I presently occupy, or intend to occupy, the subject property as my principal residence, and am not now considering any proposal to sell subject property to third persons." All the while, though, Santiago continued to live on Potomac. FWIW readers will remember what happened next: WGN-TV and the Medill Watchdog Group collaborated on a series entitled "Judging the Judges." Prominently featured in the series were stories about subcircuit judges who might have moved, for one reason or another, from the subcircuits from which they were initially elected. I wrote about the series; from this archived post you can still read what WGN and Medill Watchdog had to say at the time about Judge Santiago's mortgage (I had not mentioned her by name in my post). The Court Commission's August 18 Order notes (pp. 4-5) that, after the WGN pieces aired, Judge Santiago took corrective action. First, she repaid the homeowner's exemption on her taxes (she'd improperly claimed that, too) and, second, she notified her lender that she was not living at the property after all. And Santiago's lender turned out to have a corporate heart of gold: It did not prosecute her for fraud but instead "attempted to help her rectify problems resulting from her claiming the Spaulding property [as] her primary residence" (p. 5). The lender did not even require Judge Santiago to refinance; although the lender acknowledged in writing that it had been notified that Santiago was not using the Spaulding home as her primary residence, the mortgage would be left as is. Since then, Santiago has sold the house on Spaulding and bought another one safely within the confines of the Sixth Judicial Subcircuit. The tainted mortgage is gone. Judge Santiago testified at her hearing before the Courts Commission (p. 5), "she never deliberately intended to deceive AEM, but admitted she was 'careless' in signing the mortgage documents. Respondent signed the 2013 mortgage documents in a room in the courthouse while she was on her lunch hour, and the entire process took only ten to fifteen minutes. She said she was rushed and did not actually read the documents, but just signed in the places she was required to sign. Respondent testified she has been humiliated and embarrassed by the incident, and she has been humbled. She testified her career has basically been ruined because she failed to read the mortgage papers prior to signing them." Santiago told the Commission that her entire legal career has been spent in the area of criminal law; she "knows little about real estate law" (p. 5). The Commission stressed that most of the evidence in this case was stipulated to and most of the facts in the case undisputed. Because Santiago did not really contest the Judicial Inquiry Board's allegations of violations, the Commission saw its task as merely determining what sanction to impose. The Commission noted (p. 8), "Respondent engaged in consistent hedging and her candor was reasonably in question." On the other hand, the Commission noted (p. 9), Santiago's "actions and omissions were not related to her official duties. Further, there is no indication in the record of any prejudicial impact to any litigant appearing before respondent. * * * There is no contest in the record that the actions of respondent are not likely to recur and the financing situation, as well as the question of residential qualification, appear to have been resolved." At a minimum, respondent knew or should have known of her residency problems when she faced a challenge to her candidacy for circuit judge of the Sixth Judicial Subcircuit in the 2012 election. Subsequent to that, however, the record shows that in her disclosures, in order to secure an FHA loan, she designated the Spaulding property residence as "primary." Respondent argued that her actions could be characterized as careless. Given, however, the highlighting of her residence problems in the electoral challenge to her candidacy, one could reasonably characterize her activities as reckless. In effect, respondent got trapped. Her response to her situation only made her situation worse. She could be charged with reasonable notice of her problem due to the electoral challenge; however, the documents that she executed and the representations she made to AEM aggravated rather than corrected the situation. Respondent argued that ultimately no harm was done to AEM as all obligations were paid in full as the house was sold for more than the original obligation. We note, however, that her actions, taken in order to qualify for an FHA loan as opposed to a regular residential loan and the subsequent financing resulted in financial benefit to her. We also note the corrective actions were taken only subsequent to exposure of her residency problems by the media. Now, for the non-lawyers, and even for the lawyers-who-are-not-judges who may happen on this post, let me suggest to you that it may not go so well for you if you misrepresent your residency plans in a mortgage application and the mortgage company finds out about it. Or if the county finds out that you're claiming a homeowner's exemption on property where you don't reside. But Judge Santiago has been spared; she has the opportunity now to resume her judicial career and restore her reputation. 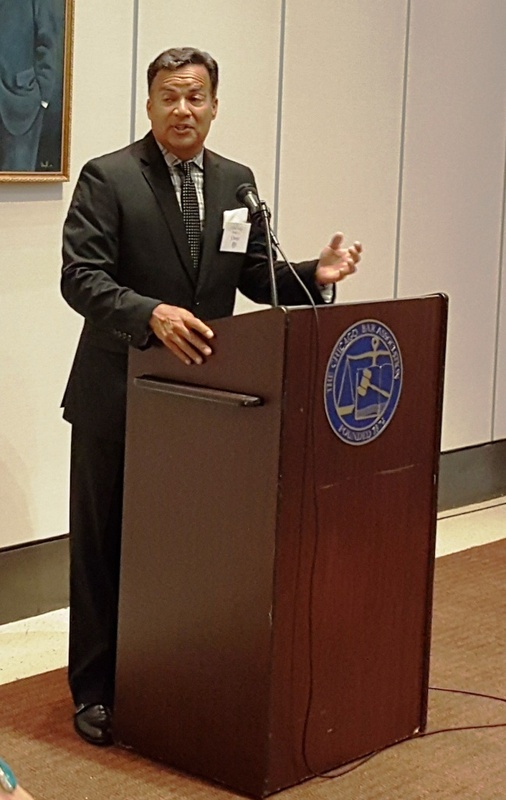 The CBA's Corboy Hall was packed last evening for the Illinois Judges Foundation Summer Reception. Proceeds from the reception support the charitable and educational programs of the Illinois Judges Foundation, the charitable arm of the Illinois Judges Association, including in particular the Harold Sullivan Scholarship. Three of these scholarships were awarded last evening. 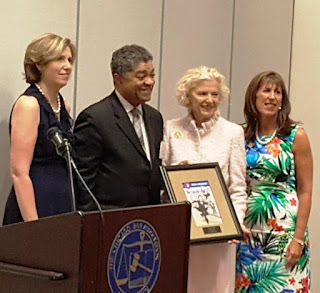 Illinois Supreme Court Justice Anne Burke, retired Illinois Appellate Court Justice Gino L. DiVito, and Lake County Chief Judge Jorge L. Ortiz were honored by the IJF as judicial icons. Pictured below are Lake County Associate Judge Elizabeth M. Rochford, IJF Immediate Past President; Cook County Chief Judge Timothy C. Evans, who provided an introduction for Supreme Court Justice Anne Burke; Justice Burke; and Cook County Associate Judge Jeanne Reynolds, the current President of the IJF. Here is Justice Burke, accepting her award. 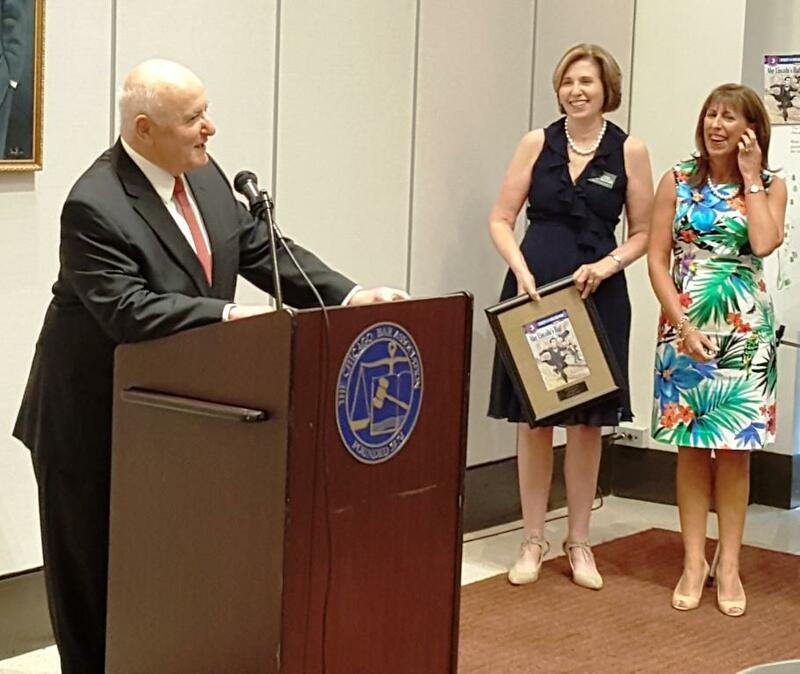 Justice DiVito accepted his award as Judges Rochford and Reynolds looked on. This is Lake County Chief Judge Jorge Ortiz accepting his award. The Illinois Judges Foundation also acknowledged the passing of Laura C. Liu, Appellate Court Justice and IJF President in 2013-14. Justice Liu's husband, attorney Michael J. Kasper, provided appropriate and moving remarks as their daughter, Sophia, looked on. 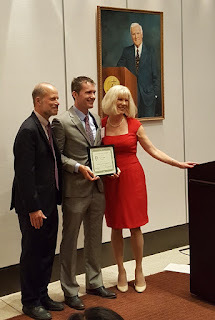 Two of the three Harold Sullivan Scholarship Award winners, Jennifer DiVincenzo of John Marshall Law School and Matthew Griffin of Chicago-Kent College of Law, were present to accept their awards from Scholarship Committee Chair, Judge Diane Larsen. 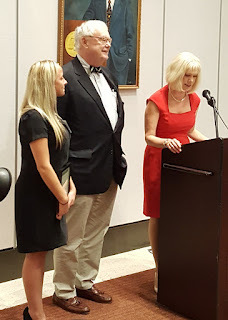 Pictured below are Judge Larsen, John Marshall Dean John E. Corkery, and Ms. DiVincenzo. At right are Chicago-Kent Dean Harold J. Krent, Mr. Griffin, and Judge Larsen. The third award winner, Patrick Tipton from the University of Illinois College of Law, was unable to attend, Judge Larsen explaining that he had previously committed to assisting at an incoming student orientation at the school. 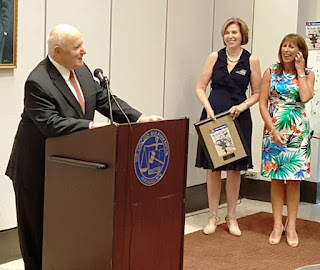 IJF Auxiliary Committee member Christine Athanasoulis was also cited by the organization for her assistance in the organization's fundraising efforts. 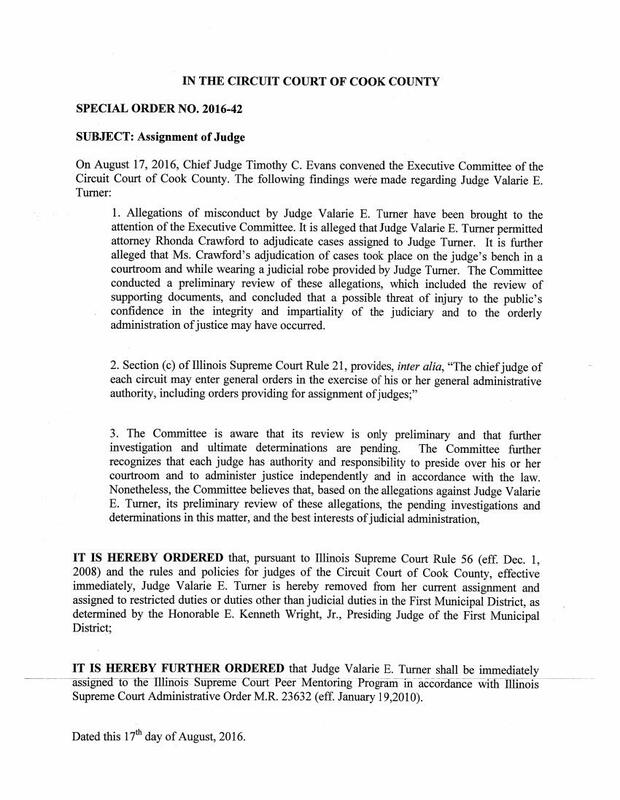 Cook County Chief Judge Timothy C. Evans announced this afternoon that, pursuant to action taken today by the Executive Committee of the Circuit Court of Cook County, Judge Valarie E. Turner has been temporarily reassigned to duties other than judicial duties in the office of the Presiding Judge of the First Municipal District, Judge E. Kenneth Wright, Jr. The assignment is effective until further notice. According to the Chief Judge's press release, Judge Turner allegedly allowed attorney Rhonda Crawford, a law clerk/staff attorney employed with the Office of the Chief Judge, "to adjudicate at least two cases from the bench while wearing a judicial robe in Judge Turner’s courtroom." Crawford has likewise been suspended without pay from her current job, according to the Chief Judge's press release. Rhonda Crawford's name should be familiar to FWIW readers: This past March, Crawford defeated two other candidates, including a judge sitting pursuant to Supreme Court appointment, for the Hopkins vacancy in the 1st Subcircuit. Crawford faced no Republican opponent in November. She was on track to assume judicial office for real on the first Monday in December. Crawford did not participate in either the CBA or Alliance candidate screenings and was unanimously rated not qualified or not recommended as a result. An alert reader directed me to a new letter from Judge Sheryl A. Pethers published yesterday on the Windy City Times website. That's a link to the complete letter. Please click over and read it. I appreciate the fact that Judge Pethers did not intend her original memo for the general public. I referenced it here, and responded to the Sun-Times column about it, when the memo was already in the public domain. Here again is a cautionary tale about the modern age: Anything we write, whether intended for general consumption or not, may slip into the public eye. If you send a private letter to Aunt Betty and it winds up getting quoted in the newspaper, you probably know who to blame. If you send an email blast, however, to multiple recipients, you should realize that you are encouraging the sharing of the views expressed therein. You lose control, then, of how that sharing takes place, and with whom. And if you post something on Facebook, even though you have only 22 "friends," you are only one "share" away from a potential news story. And one last suggestion: If a reporter ever does call you about something you've written -- especially if it's not something you intended for the consideration of the general public -- return the call immediately. You may not be able to prevent the wider dissemination of your statement, even if it was only meant for poor Aunt Betty's private amusement, but it's better to try and provide clarification and context before than after. August 25 fundraiser at Cavanaugh's for James E. Hanlon, Jr. Supporters of James E. Hanlon, Jr.'s bid for the "A" vacancy in the 12th Subcircuit are planning a fundraiser for their candidate on Thursday, August 25, from 5:00 to 7:00 p.m., at Cavanaugh's Pub, 53 West Jackson, in the Monadnock Building. The fundraiser is being hosted by Beuke & Beuke, Mike Krejci & Associates, and the Law Offices of Michael F. Clancy. The organizers say "donations are welcome" (well, yeah, it's a fundraiser). Persons interested in attending are asked to contact Nicole at (312) 427-3050 or by email at nicole@beukelaw.com before August 20. Hanlon is the Democratic nominee for the "A" vacancy; his Republican opponent in November is Steven A. Kozicki. Dan Mihalopoulos (@dmihalopoulos) gets all the best judicial emails. I admit to being jealous. So rather than reproduce Mr. Mihalopoulous's work product here, let me react to some things in the column and in the, um, attachments. Isn't it interesting that today's column follows so closely on the heels of yesterday's disclosure that Chief Judge Evans may face a challenger next month? Sure, it might just be a coincidence. Then again, as Finley Peter Dunne's Mr. Dooley observed more than a century ago, "Politics ain't beanbag." Mihalopoulos wrote, "[Judge Pethers] doesn’t name any of the allegedly better-clouted colleagues who were promoted unfairly over her. But Pethers put the blame for the situation squarely on longtime Chief Judge Timothy Evans." I guess we'll know for sure if there are more of these kinds of stories in the next couple of weeks... but there may be some storm clouds gathering on Judge Evans's horizon. There are obviously different levels of nobody-sent-ness. There's a neologism for you (OED take note). But Judge Pethers, who was elected to the bench (from the 8th Subcircuit, for all you vultures out there salivating about the forthcoming vacancy) in 2004, describes herself as a "nobody nobody sent." Judging by the comments I regularly receive here, I'm pretty sure that I lost a number of readers to head explosions when they read that. They'd give anything for that one brief shining moment that Judge Pethers experienced after the 2004 Primary, the moment that she finally learned that she'd bested a field of three challengers (all male) even if it was by only 53 votes over her nearest competitor. I have a number of readers who would protest that, in winning an election, Judge Pethers necessarily became Somebody, capital-S deliberately inserted. But I also have a friend who never tires of telling me that 'where you stand depends on where you sit'---and in a group where everyone has won an election---where winning an election is just the minimum buy-in to the game---maybe Judge Pethers was politically disadvantaged. She obviously felt that she was. And I sure as heck have nothing to add on the questions of whether Judge Evans did or didn't respond to Judge Pethers's request for assignment to the Law Division or whether Judge Pethers did or did not withdraw that request. But, while I understand that those of us among the Great Unwashed cannot simply walk in and see the county's Chief Judge, wouldn't you think that fellow judges, especially judges working in the same building, would have just a tad more access? Why is it not OK to acknowledge that being a judge is a job? 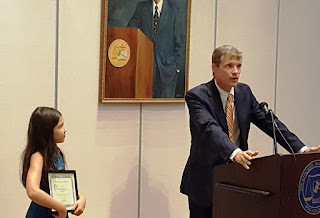 Judge Pethers wrote, "I never thought I would refer to being a judge as a 'job,' but it feels that way." Why shouldn't it? Being a judge is a job. It is also a great honor and privilege---but if there wasn't also a paycheck every couple of weeks to accompany that honor, I daresay most of Judge Pethers' colleagues would likewise quit. Being a judge is (I assert with all the confidence of an outsider) a great job, but I think I'm on safe ground in advancing that claim. As Judge Pethers acknowledged, "Good pay, great benefits, lots of vacation. Even as a 'job,' it's the best one I've ever had." The real story may be that there are some who have the job but aren't doing it. Judge Pethers mentioned, more or less as an aside, that "there are judges who regularly don't even come to work, but get to choose their courtrooms." Let's stop that statement before the comma. There are judges who regularly don't come to work? Of course Mihalopoulos picked up on that statement. Andy Shaw at the BGA and Rick Tulsky at Injustice Watch probably perked right up when they saw that one, too. And I had a commenter here recently who made a very topical joke about two judges "notorious for taking off far more days than they actually show up, [who] gave court personnel and lawyers a shock recently when they both appeared at the Daley Center on one of the days they called in sick. It was soon discovered that [they] were playing Pokémon Go and given their unfamiliarity with the building, did not realize they were in the courthouse." Maybe this is all so much slander. But, if it's not, I sure hope we can count on the bar association JECs or other reform-minded groups to name names and provide documentation. Because---and my readers know this as well as anyone---there is no shortage of qualified persons willing to step up and replace those who are not doing the job. Chief Judge Evans to face challenge in reelection bid? The Chicago Tribune reports this morning that Judge Thomas R. Allen will attempt to unseat Judge Timothy C. Evans as Chief Judge of the Circuit Court of Cook County. Judge Allen, like Judge Evans a former Chicago Alderman, was appointed by the Illinois Supreme Court to a countywide vacancy in late 2010 and thereafter elected to the Circuit Court from the 10th Subcircuit (running without opposition in the 2012 primary and general elections). Judge Allen is currently assigned to the Chancery Division of the Circuit Court. The full judges of the circuit vote on who will be their chief. The election will be held next month. Since becoming Chief Judge in 2001, Judge Evans has only faced one prior reelection challenge, that from former Judge William D. Maddux in 2010. Update 8/3/16: Herewith, the link to Mark Brown's coverage of the potential challenge in the Chicago Sun-Times.